To get a real sense of New Orleans’ local flavor, a day trip down Magazine Street is essential. From museums and galleries to bars and boutiques, this six-mile stretch has it all. You’ll find some of the best local art, authentic food, and stunning scenery as you make your way through three of the city’s iconic neighborhoods: the Warehouse District, the Garden District, and Uptown. A stroll down Magazine street begins in the Warehouse District. Your first steps bring you right to some of New Orleans’ best museums. 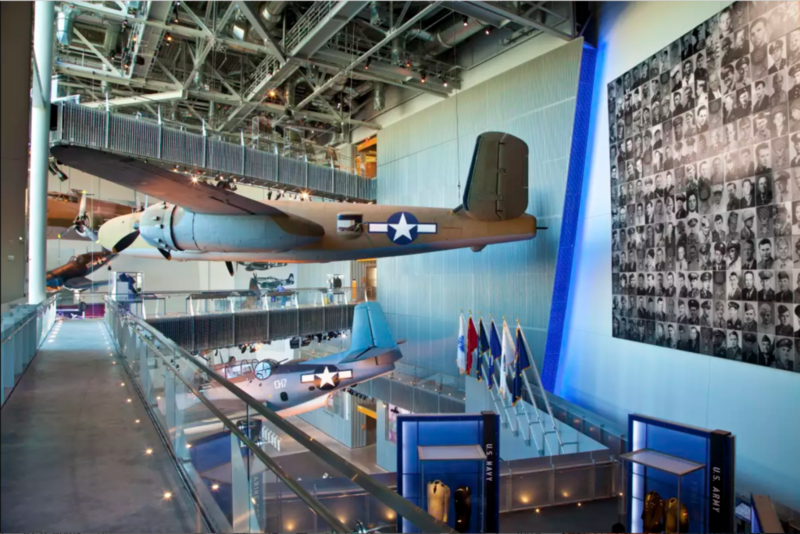 If you’re a history buff, The National WWII Museum is worth exploring. Located right on Magazine, the museum invites you to step inside for an historic experience. Interactive exhibits, expansive collections, and a 4-D theater bring the story of WWII to life. Filled with personal accounts and artifacts, the galleries present a sweeping portrait of the war that changed the world. Magazine Street runs right into the Lower Garden District and is home to some of New Orleans’ coolest cafés and eclectic eateries. Start with a pit stop at French Truck, NOLA’s favorite coffee roaster. 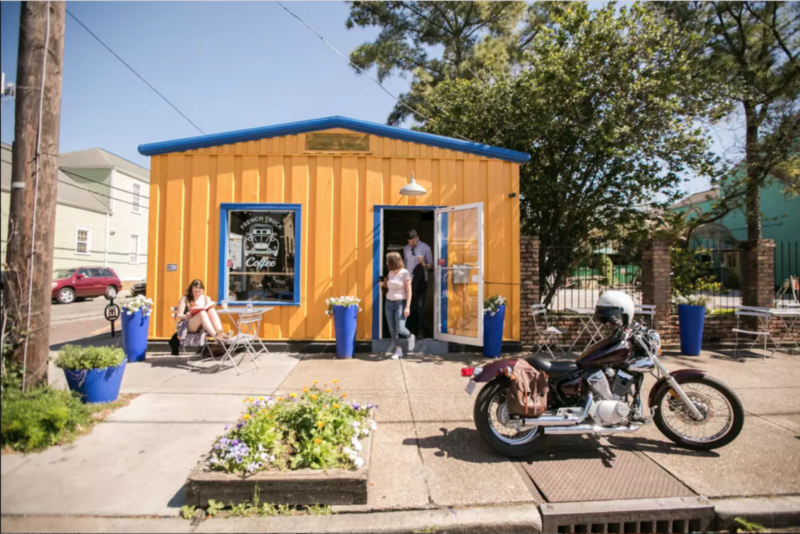 Their bright yellow storefront invites visitors to step inside, take a peek at their roastery at work, and enjoy an iced NOLA, their refreshing signature drink. For a sit down meal, grab brunch at Surrey’s Café a few blocks away. You can drink in the funky décor while you sip on their fresh-squeezed juices. 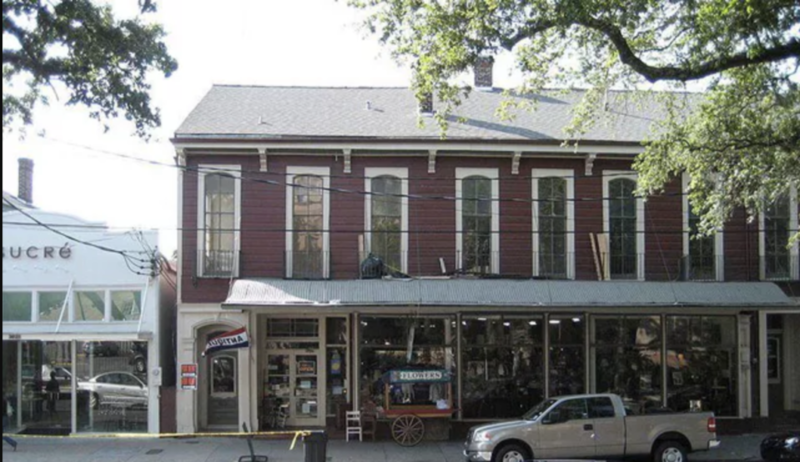 For shoppers looking for some authentic New Orleans goods, Magazine Street is a must-see. The street is a central hub of locally owned businesses. Charming boutiques and shops can be found on each block. Modern art galleries and quirky vintage stores sit side by side. Put them all together and you get Magazine’s one-of-a-kind charm. Be sure to pop into the Magazine Antique Mall, where an endless array of vintage and unusual finds are always worth a look. All that shopping can work up an appetite. Luckily, you’ve got great options in the Garden District stretch of Magazine. Grab a bite at Dat Dog, a specialty hot dog joint and a longtime local favorite. Take a seat and enjoy your meal in their colorful courtyard, or explore the Magazine Street Art Market that takes place on their patio every Friday and Saturday. For dessert, treat your sweet tooth to Sucré across the street. Or keep rolling towards Uptown and get a snoball at SnoWizard. 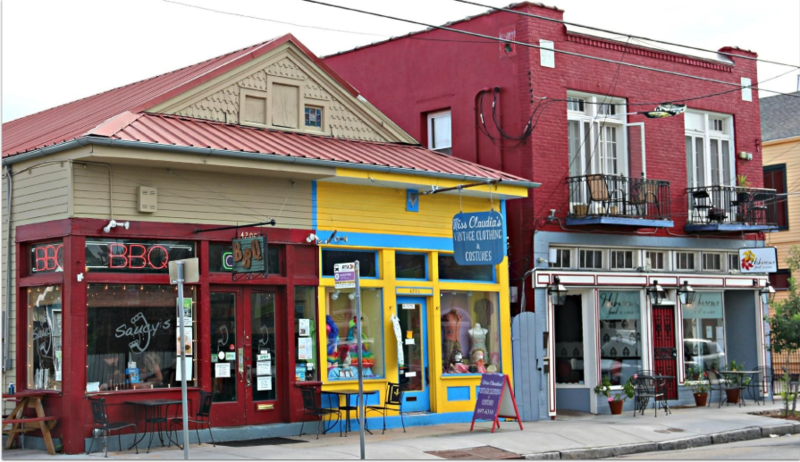 While enjoying all this shopping and delicious food, be sure to take in the stunning architecture and colorful community that runs the length of Magazine Street. Grand 19th-century homes, Victorian cottages, and hip modern storefronts share the same city blocks. Rows of shotgun-style houses brighten up the sidewalk with candy-coated colors. The buildings are a varying mix between residences and retail stores, giving the six-mile-long street an exciting and diverse character. The grand finale of Magazine Street is Audubon Park. This tranquil public space has attracted locals and visitors alike for over a century. Well known as one of New Orleans’ must-see parks, it is an awe-inspiring sight for the end of your journey. The park’s endless green scenery is filled with ancient oak trees, lagoons, and picturesque picnic spots. You can follow the paved walking loop around the park and take in all the natural splendor. Or find a shady spot to sit back, relax, and revel in your amazing day on Magazine. When you book your stay at Bienville House, your adventure along Magazine Street begins right outside your hotel room. Our location in the historic French Quarter is steps away from the first block of Magazine Street, letting you enjoy the best of New Orleans with ease.